Twin Speak:DressCode: Snow. Carmel Snow. Read our lips and our hips!!! 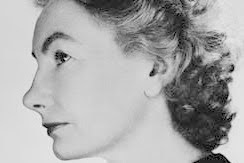 The quote, “The Well-Dressed Woman With A Well-Dressed Mind,” is the mantra by which the late Carmel Snow guided Harpers Bazaar as editor-in-chief from 1934 to 1958. Considered by Henri Cartier Bresson as nothing less than a genius, Snow is primarily responsible for incorporating art, fiction and photography into fashion journalism. She also famously said, “You cannot run fashion on Gallup polls.” In the spirit of Carmel Snow, the July 26 Twins, Barbara and Phoebe, salute all the fearless, fabulous, ferocious fashion warriors operating in today’s confounding economic trenches.